How much does one parking spot add to rent? Click here for full sized graphic. Parking is expensive. It costs thousands of dollars per stall to build. It occupies valuable real estate. It is ubiquitous, accompanying nearly every building built across the United States. Yet at nearly every destination, drivers don't directly pay for the parking they use. Instead the cost is hidden, bundled into the grocery bill, benefits package, and rent of every shopper, employee, and tenant. Everyone pays the same amount for parking whether she or he walked, rode transit, carpooled, or drove alone, but rarely does anyone see that price itemized on a receipt. As a result, most people are unaware of the heavy financial burden they bear for the sake of parking. 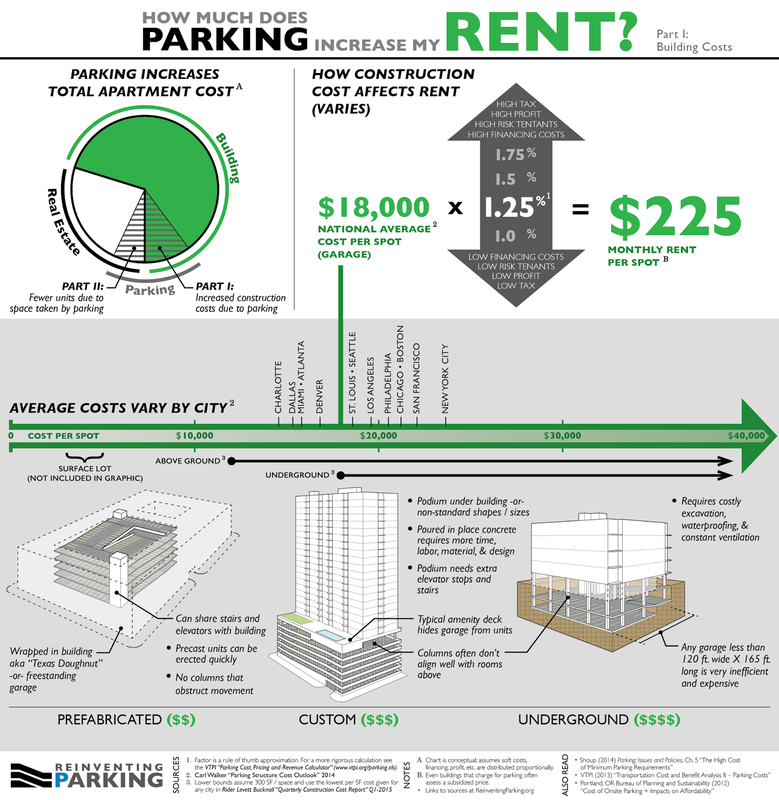 The above graphic takes a look at one area where parking adds significantly to a household's expenses: Rent. So how much does one parking spot add to an apartment's rent? There is no single answer to that question. Construction costs are affected by local soil conditions, zoning requirements, site constraints, regional differences in construction costs, and the type of parking to be built. On the other hand, the rent needed to justify an initial capital investment varies according to local property taxes, financing costs, resident turnover and delinquency rates, et cetera. The graphic attempts to present the range covered by these variables while providing numbers that might be considered typical for structured parking in the United States. The effect of each parking spot on affordability is significantly higher in urban communities than suburban ones both because the land occupied by parking is more expensive in urban areas and because building structured parking is many times more costly than paving surface lots. This reality affects the ability of lower income households to live in urban areas since parking costs roughly the same to build whether an apartment is luxury grade or modest. An $18,000 spot might not have a noticeable impact on the rent of a $300,000 unit, but it would definitely be noticed by someone renting a $75,000 unit. Even when minimum off-street parking requirements are eliminated (and on-street parking is properly managed), the practice of bundling parking with rent may persist. 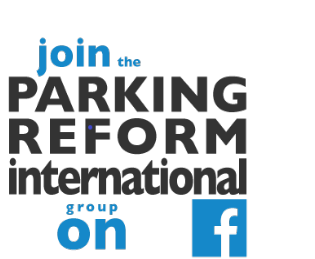 It is imperative that cities find a way to separate rent for cars from rent for people either by encouraging or mandating that parking be rented separately. People should be allowed to make their own transportation choices, especially when all the other choices are more sustainable and equitable. When renters have no choice other than to pay for car storage regardless of whether they possess a car, they are not truly given that freedom. People with the means to own a car OR to live centrally but not to do both, should be allowed to choose the latter. Cities have many reasons to encourage their citizens to live with fewer cars. Fewer cars owned and operated in a city reduces pollution and greenhouse gas emissions, eases traffic and infrastructure burdens, and increases households' disposable income. Hiding parking costs in rent runs in direct opposition to those goals. There are some who have argued that construction costs, whether higher or lower, have a negligible effect on rents because property owners will charge whatever the market will bear regardless of upfront costs. This might be true if one assumed that construction costs have little effect on local supply. Furthermore, any one building is unlikely to strongly affect rents in an area. A lone developer who constructs a new apartment building in a market with strong demand will not undercut existing rents simply because the new units cost less to build. Over time however things will change as long as there is available land to be redeveloped at a higher density. Every dollar invested in creating an apartment translates to a higher minimum rent required just to break even. If a developer does not expect a new unit will command this target rent, that potential project will not be built. If the amount of parking can be reduced or eliminated, the money saved on construction will lower the required rent to break even and make some projects viable that were not viable before. More viable projects translates to more units getting built resulting in greater competition and thus lower local rents if demand holds constant. This greatly understates the cost of adding parking in built-up areas (both cities and inner suburbs). There is no vacant land that the zoning code allows to be used for parking structures, so above-ground parking structures generally replace existing surface lots. The construction cost must be compared to the net amount of new parking, which is the parking on the upper floors minus the spaces in the surface lot lost to ramps and structure. As I discuss in this blog post, my locality (Montgomery County, Maryland, a suburb of Washington) is currently paying $64,000 per space for an underground garage and $53,000 per new space for an above-ground structure. Thanks for your comment. 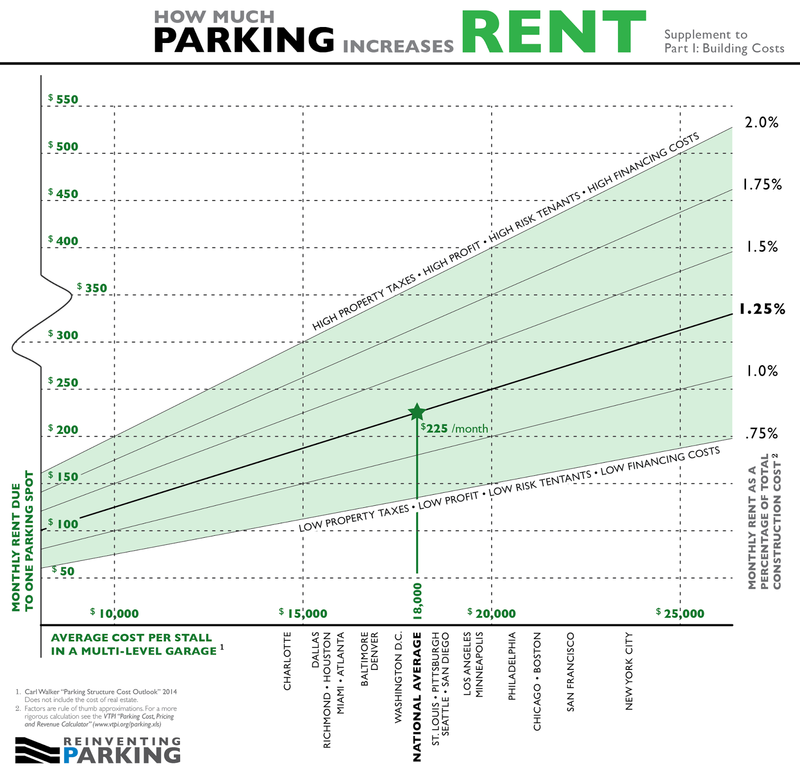 It is true that parking can cost significantly more to construct than the averages shown on the graph. In my experience working in architecture, it can also go as low as $9K-$10K per space, but I can't use that as a data source. The chapter by Donald Shoup that I linked to above finds costs higher than what I presented in my graphs since it relies primarily on the Rider Levett Bucknall data rather than the lower Carl Walker numbers. There is a huge range of costs for structured parking, but I used Carl Walker's averages because they are conservative and, I believe, fairly accurate on the whole. I hope you will continue to point out that parking can be many times more expensive than what I've shown because it is important for others to understand that these numbers are by no means a ceiling. The calculation is based on the premise that the minimum monthly rent required to justify a capital investment (in this case a parking spot) is directly proportional to the initial cost of that investment. Thus, the monthly rent can be expressed as a percentage of the initial investment. The numbers I used to arrive at $225/month were $18,000 (the U.S. national average per stall) x .0125 = $225. Good morning. Is there a report or graph, showing average parking rates across the big cities? I found your post quite useful and informative. If you place your car on a private lot in front of an apartment building or anywhere else, talk to your landlord or the owner of the lot about placing signs up informing others that the area is not to be used by anyone but residents or otherwise. If people think that their car is in danger of being towed from the area, they may be less likely to park there when they see signs. Otherwise, people will place their cars wherever they please if they do not see any signs.